We can think of the amount of water flowing through the hose from the tank as current. 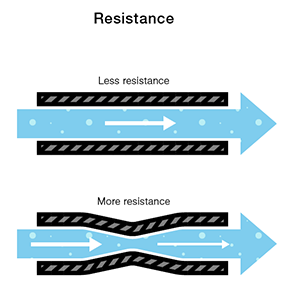 The higher the pressure, the higher the flow, and vice-versa. 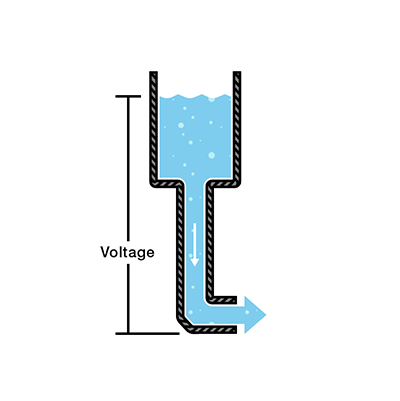 With water, we would measure the volume of the water flowing through the hose over a certain period of time. With electricity, we measure the amount of charge flowing through the circuit over a period of time. 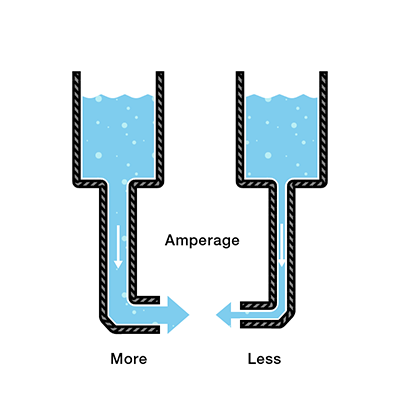 Current is measured in Amperes (usually just referred to as “Amps”). 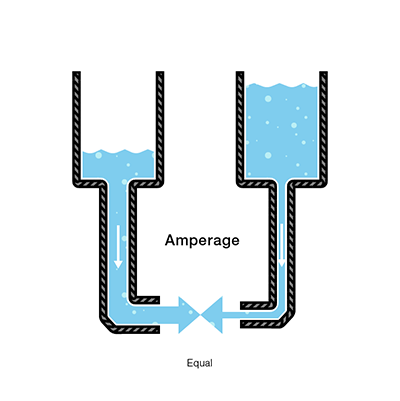 An ampere is defined as 6.241*1018 electrons (1 Coulomb) per second passing through a point in a circuit. Amps are represented in equations by the letter “I”. Imagine a river in a continuous loop, an infinite, circular, flowing river. If we were to place a dam in it, the entire river would stop flowing, not just one side. Now imagine we place a water wheel in the river which slows the flow of the river. It wouldn’t matter where in the circle the water wheel is placed, it will still slow the flow on the entire river. 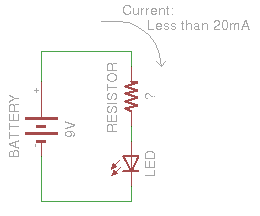 This is an oversimplification, as the current limiting resistor cannot be placed anywhere in the circuit; it can be placed oneither side of the LED to perform its function. 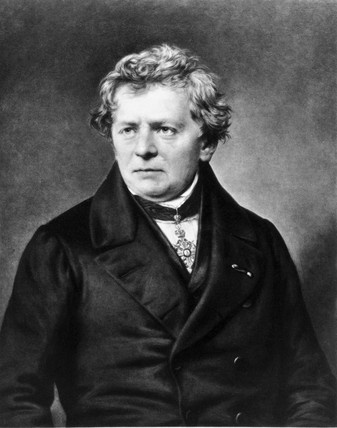 For a more scientific answer, we turn to Kirchoff’s Voltage Law. 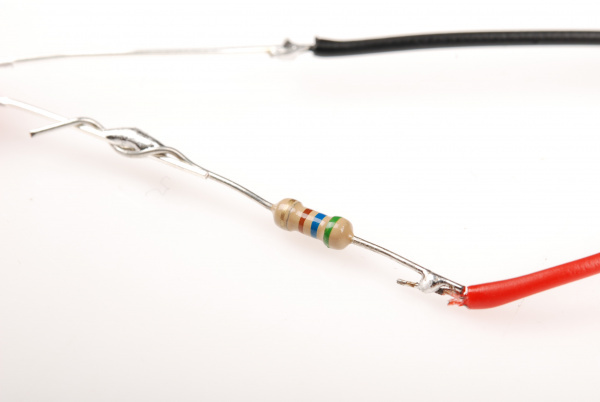 It is because of this law that the current limiting resistor can go on either side of the LED and still have the same effect. For more info and some practice problems using KVL, visit this website. These concepts are just the tip of the iceberg. 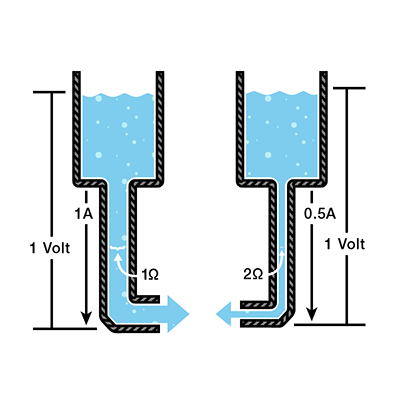 If you’re looking to study further into more complex applications of Ohm’s Law and the design of electrical circuits, be sure to check out the following tutorials.